After years of back problems resulting in physical therapy, I knew I needed to make a change. The biggest problem for me was the 11 hours a day I spend at my desk, hunched over my keyboard. After discussion with my handy wife, a treadmill desk seemed to be the best way forward. And I’m not alone, HBR did a great article on it: Sitting Is the Smoking of Our Generation. I’ll explain in a bit how we built it, but once in place, I averaged ~6 miles per day, with my best one-day distance being around 11 miles. When on a video conferencing call (which is becoming more and more common), I can’t use the treadmill at all, so I just stand. When on an audio call, I typically walk at about 1.5 miles per hour. Any faster and the noise of the treadmill becomes noticeable to the others on the call. When not on any call, I can walk between 2.0 and 2.5 mph while still being able to type and work. There are many great solutions out there if you are starting from scratch, but we had a treadmill in the basement collecting dust for years and I had recently purchased two new tables. 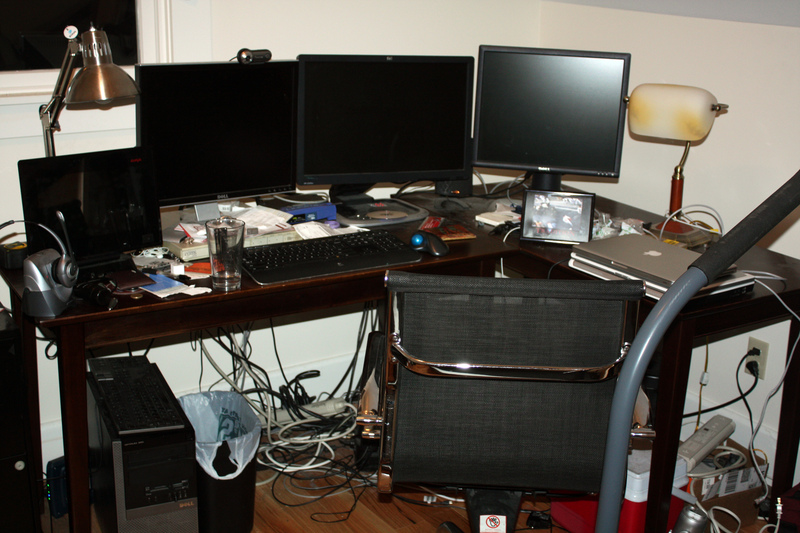 The other oddity, if you will, about my office setup is that I have a lot of screens. I’ve got a Dell 960 with an Nvidia NVS video card, allowing me 4 DVI connections. 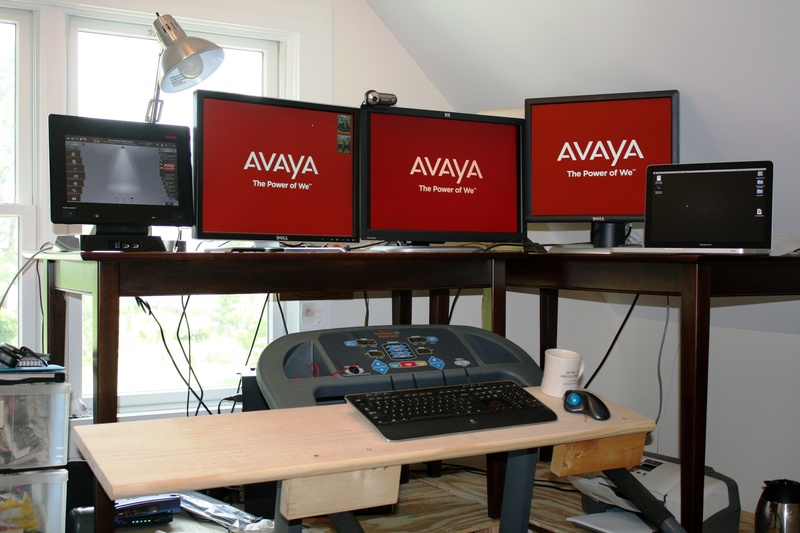 I use three monitors (the 4th connection is to my Plasma TV), a tablet-style phone from Avaya (The Flare on ADVD), and a MacBookPro. So for me, I was going to need to retain a great deal of desk space. We brought the treadmill up from the basement and my wife (who is wicked talented with any such project) went to Home Depot to buy a 2×8 board long enough to not only go across the handlebars of the treadmill but also extend beyond it to give me a good deal of space for my wireless keyboard, mouse, and other things. 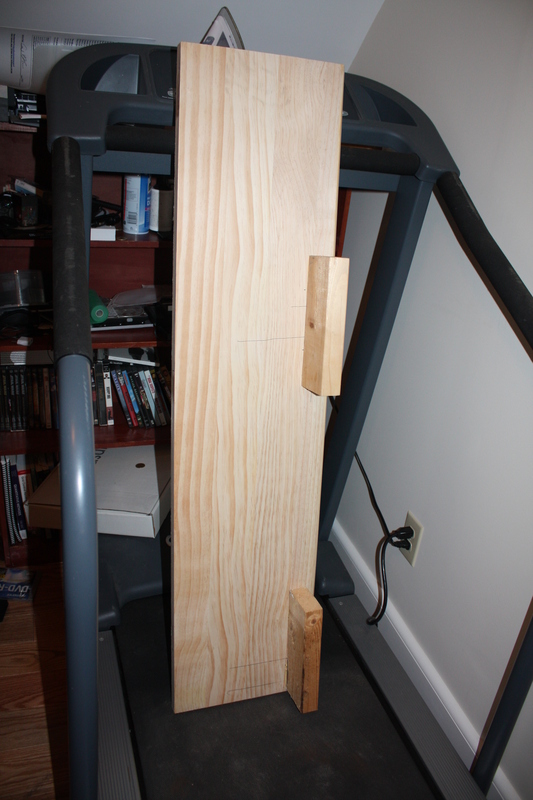 The handlebars on our treadmill, however, tilt down, so she used some brackets and more wood to raise one end up striving for a level shelf. We consulted OSHA diagrams, based on my height, on how high the keyboard should be. The result, not attached, looks like this. We then used some 4×4 posts and plywood to essentially build cheap tables to go underneath our existing tables and raise them 33”, which was the height we needed in order to get the monitors at the proper viewing height for me (again, via OSHA). Below is the finished project.